Dublin, Ireland is very far from the killing fields of the Western Front. Yet it was here in the spring of 1916 that thousands of British soldiers found themselves in action in what was then considered the second city of the British Empire. The graveyards of Dublin hold the remains of a number of those that fell in action, their neglected and often forgotten gravestones reminders of a turbulent past and a fallen generation. On Easter Monday, 24th April 1916, Patrick Pearse, a schoolteacher and commander of the Irish Volunteers, read the proclamation of the Irish Republic from the steps of the General Post Office in Sackville Street, Dublin. 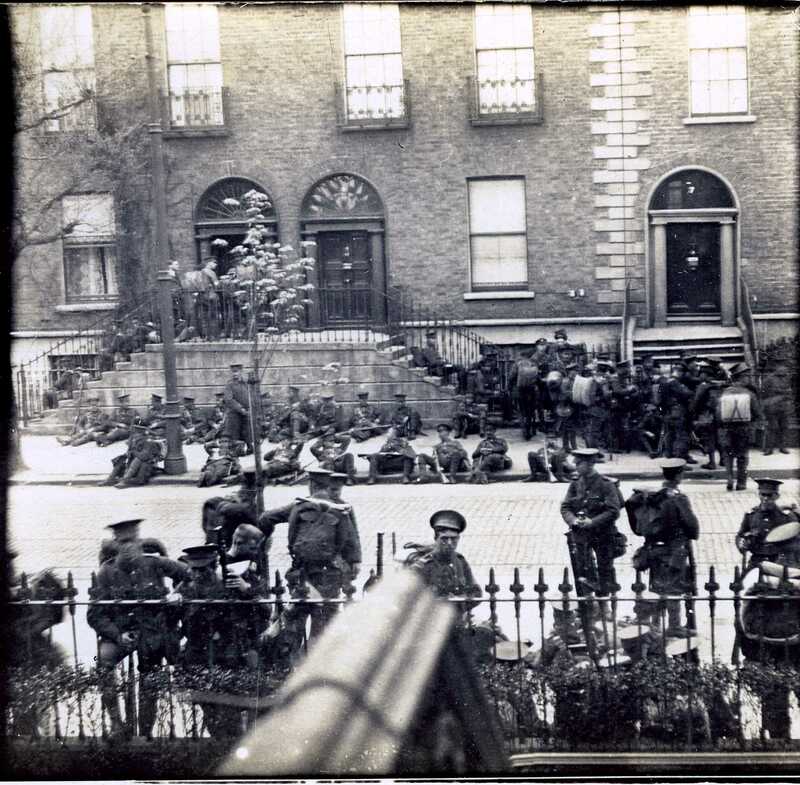 As this event was unfolding battalions of Irish Volunteers were occupying strategically located positions throughout Dublin city in order to defend the newly declared republic. 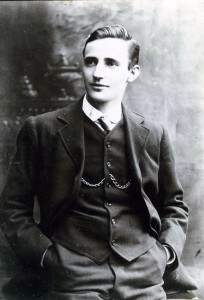 Earlier that morning, one of those battalions, under the command of Commandant Eamon de Valera, occupied their designated position, Boland’s Bakery in Ballsbridge, Dublin. At 11.00 hrs Lieutenant Michael Malone led sixteen Volunteers from “C” company, 3rd battalion towards Mount Street Bridge, a key crossing point into Dublin city. Their orders: to prevent British reinforcements from entering Dublin. Here they set up several well-located positions from the bridge to the junction of Northumberland Road and Pembroke Road. These positions consisted of a schoolhouse, two houses at 25 Northumberland Road and Clanwilliam House and a Parochial Hall. Immediately on entering their designated posts, the Volunteers began turning each position into an impenetrable fortress. Barricades of furniture reinforced the locked doors of each post. Many men had obtained leave for the holiday weekend and as they returned to barracks they were informed of the impending move. Soldiers from each battalion were furnished with forty- eight hours dry rations and a quantity of ammunition. The men were enthusiastic at the thought of active service overseas and believed that a critical situation had developed on the Western Front and that the 59th division was destined for France or Flanders. The mobilised division began immediate embarkation for Kingstown (now Dun Laoghaire), Ireland. As the Sherwood Foresters were disembarking, Lieutenant Malone was fortifying his post at 25 Northumberland Road. His attention was drawn to the sound of advancing soldiers coming towards his position. Marching towards the house were a unit of British soldiers that formed part of a local Home Guard unit who were returning from weekend manoeuvres to Beggars Bush Barracks, Ballsbridge. As they reached the junction of Northumberland Road and Haddington Road, Lieutenant Malone and James Grace opened fire into their ranks. Many men collapsed as they were hit, while others ran towards the gates of the nearby barracks for refuge. They were unable to return fire, as their rifles were unloaded. After the gunfire had ceased, bodies littered the street. Locals ran from their houses to assist the wounded British soldiers. The dead and wounded were carried from the roadway. Unknown to Lieutenant Malone, the schoolhouse was vacated and its garrison returned to Boland’s Bakery. In total, seventeen Volunteers remained in defensive positions on the street. Early on Wednesday morning April 26th 1916, the newly arrived British troops assembled on the quayside in Kingstown. Some of these regiments were made up of young men from Nottingham and Derbyshire, known as the Sherwood Foresters. They were inexperienced soldiers who had only had six weeks of basic training. Many had never fired a rifle. Orders were received that the 2/5th and 2/6th battalions were to make their way towards the Royal Hospital Kilmainham via Stillorgan and Donnybrook. The 2/7th and 2/8th battalions were to follow the coast road through Ballsbridge and make their way to Trinity College. The other battalions were to remain in reserve. Carrying their full military kit, the Foresters began to march towards the centre of the city. 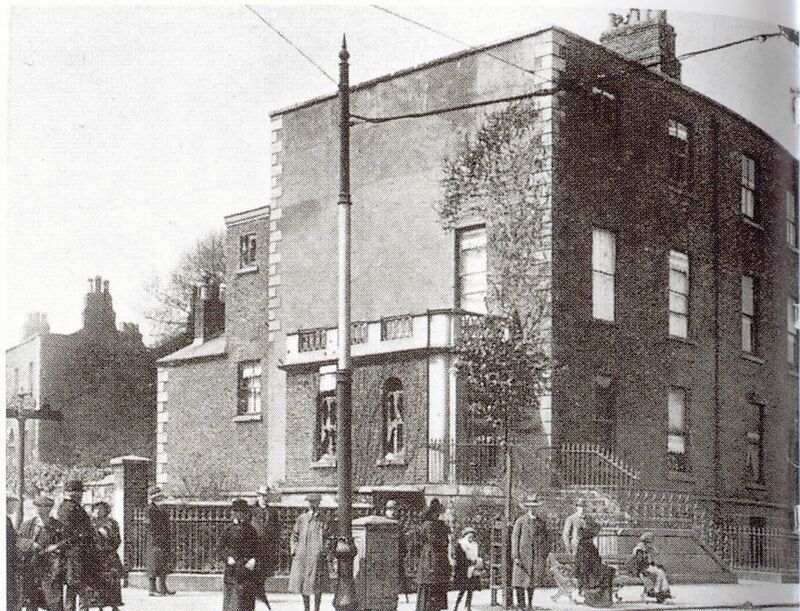 They rested at the Royal Dublin Society in Ballsbridge where they received information that the Schoolhouse on Northumberland Road was occupied by rebel forces. As the battalions moved out, Adjutant Captain F.C Dietrichsen met his wife and young children on the roadside. He broke ranks and hugged them. He was delighted to see that they were safe, as he had sent them to Ireland to avoid the increased German Zeppelin raids in England. 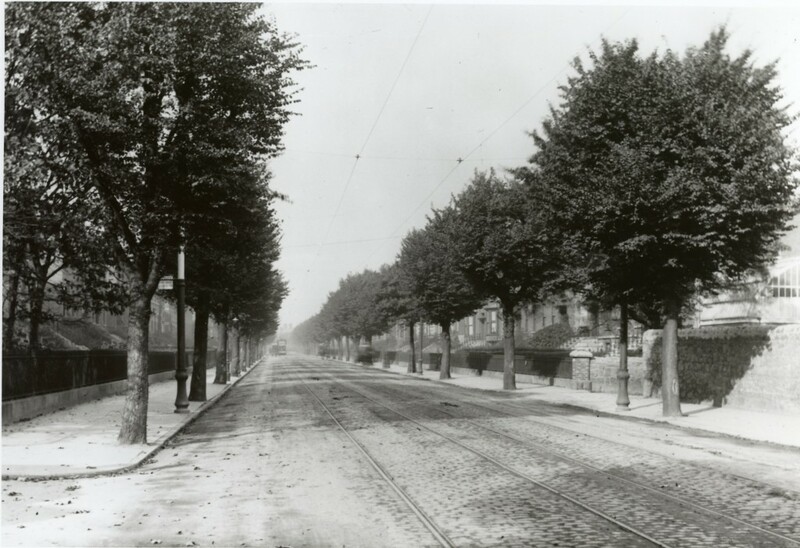 As the British troops reached the junction of Northumberland Road and Haddington Road, Lieutenant Malone and Seamus Grace opened fire into the ranks of the marching Foresters. The first volley of shots claimed the lives of ten men among them, Captain Dietrichsen. The order to drop was given and the British soldiers lay prone in the middle of the road, in full view of the guns of Malone and Grace who fired in to their ranks. The British troops charged the building but were repulsed, suffering heavy casualties. Attempts to outflank the building also resulted in more casualties. In order to storm the position, the crown forces needed to lay down a covering fire while assaulting the building with hand grenades. The regiments had failed to bring with them an essential part of their armoury, a Lewis machine gun. Having procured some hand grenades from a nearby military training school, the men laid down a covering fire with their rifles and once again charged towards the building. Casualties were again heavy but this time they managed to blow the front door in. At the same time a section of British troops gained entry to the rear of the house via Percy Lane. A barricade constructed of household furniture blocked those soldiers attempting to gain entry through the front door. Within the house the gunfire was so intense that Grace’s weapon jammed. As he attempted to clear the blockage, he shouted to Lieutenant Malone to get out. Grace took refuge in the darkened basement and tried desperately to clear his weapon. As Malone descended the stairs towards the hall, he was confronted by the British soldiers who entered through the back door and was shot dead. In order to clear the house the military threw grenades into the basement but Grace had taken cover behind a metal stove, avoiding serious injury. He remained undetected until after the battle. Unable to gain entry via the doorway, they broke a window and climbed through. The military began clearing the building by throwing grenades into each room, an action that caused the building to catch fire and burn to the ground. In the desperate action at Clanwilliam House, three Volunteers lost their lives as crown forces assaulted their position. The surviving four Volunteers escaped through the rear of the building and evaded capture. Official British casualties amounted to four officers and 216 other ranks killed or wounded during the engagement at Mount Street. Throughout the battle the Volunteer positions were supported by sniper fire from Boland’s Bakery and the nearby railway tracks. It was estimated that twenty civilians were killed or wounded as they attempted to assist the stricken Foresters on the bridge. It is a little-known fact that many people do not realize that there were more civilian casualties in the 1916 Rising than there were military casualties. The story of the Battle of Mount Street Bridge is both tragic and heroic. The scenes that unfolded in this leafy suburb made an indelible mark in the history of the Sherwood Foresters. In early 1917 the Foresters were dispatched to the Western Front, The battle for Dublin becoming a sideshow to the horrors they were to encounter in France and Flanders. Today, much of central Dublin has changed as many areas were rebuilt in the years that followed the Rising. Though Clanwilliam House was destroyed, the other posts on Northumberland Road remain more or less as they were that Easter week, a stark reminder of the carnage and death visited on this stretch of road that spring day of 1916.